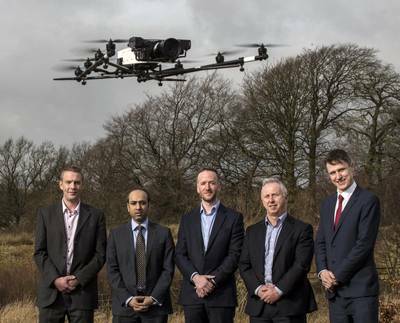 Cyberhawk, the world leader in Remotely Operated Aerial Vehicle (ROAV) inspection and survey, and a pioneer in the conversion of drone-captured data into powerful asset information, is targeting expansion following agreement on a new £2 million funding package from Clydesdale and Yorkshire Banks’ Growth Finance team. The funding will enable Livingston-based Cyberhawk to accelerate growth, create jobs, develop its products and services and expand its global footprint, ensuring the company continues to lead the commercial development of the ROAV inspection market. Established in 2008, Cyberhawk is headquartered in Livingston, Scotland, with international offices in the Middle East and Southeast Asia. The company led the creation of the drone inspection market, and has completed more than 25 world firsts including the very first onshore and offshore inspections for the oil and gas sector. Since then, Cyberhawk has enjoyed sustained growth and built a global client base in oil and gas, which includes all six supermajors, many national oil companies and independent operators. The expert team has carried out inspections across the UK, Europe, North America, the Middle East, Africa and Asia. Oil and gas, however, is just one part of the picture. As well as years of experience in survey and inspection for the utilities sector, working with key clients such as SSE, last year Cyberhawk boosted its transport credentials with a framework award from Network Rail. 2015 also saw the company build on its extensive inspection experience in the wind sector with the launch of a commercial wind turbine blade inspection solution. Crucial to the new wind turbine inspection solution, as well as to work in other sectors, is the company’s proprietary iHawk asset management software. iHawk was created to effectively convert drone-captured data into powerful asset management information in the cloud. Client asset information is intuitively accessed using a map-based interface and asset dashboards, which can be “drilled into” to see high definition photographic evidence behind each inspection rating. iHawk has evolved to accept data from other sources, such as helicopters and foot patrols, with the latter using Cyberhawk’s iHawk tablet hardware and software. Building on this inspection information, an iHawk maintenance management solution has been developed and is deployed to clients on field tablets. In addition to powerful software, engineering talent is key to effectively collecting and analysing the inspection data. Cyberhawk’s expert team has been built from engineers with experience in the company’s key sectors and through a comprehensive graduate training program. Completing the operational teams are the most highly trained drone pilots in the industry, all of whom undertake internal certification and training which exceeds the UK Civil Aviation Authority standard for pilot certification by up to four levels, the fourth being a pilot who can inspect industrial structures in an offshore environment. Having previously received equity funding from Scottish Equity Partners and Scottish Investment Bank, the investment arm of Scottish Enterprise, Cyberhawk has become a successful business and the dominant company in its market sectors. Clydesdale and Yorkshire Banks’ £2 million funding package, which will be used to support further expansion for Cyberhawk, was completed by Nick Edgar and Usman Ali from the Banks’ Growth Finance team. Cyberhawk currently employs around 50 staff, and numbers are expected to increase significantly over coming months as the company further expands its drone and software businesses. With North America a key target market for future growth, the company also plans to open a Houston office later this year. Craig Roberts, CEO of Cyberhawk, said: “Capturing images with drones may be considered a relatively simple process in certain market segments, but turning that data into something which is of genuine value to asset managers is the real challenge for the industry. We consider ourselves pioneers in the conversion of drone-captured data into actionable management information and have delivered multiple projects, in volume, to each of our key markets. “Drones deliver dramatic cost, safety and productivity benefits and, in combination with iHawk software, we have a compelling proposition for our target markets. “Cyberhawk’s recent performance has been outstanding, and this funding comes at an excellent time as we embark upon a new phase of significant growth and expansion to maintain our world-leading reputation. Nick Edgar, Senior Director, Growth Finance at Clydesdale and Yorkshire Banks, said: “Cyberhawk’s management team has built successfully on the firm’s global track record of success in oil and gas by extending its services into other sectors such as utilities and renewables. There is clearly further potential for growth via the strong relationships which the company has already established in the rail industry.